A classic example of El Greco’s trademark polyester/nylon sheen. Things are always a little distorted, too. 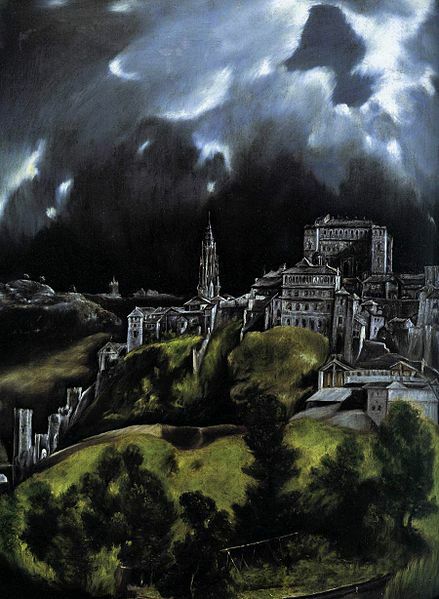 I’ve often found El Greco’s style to be very modern and impressionistic. Note the shadowiness. Even the shadows have shadows. Although the themes are always religious, as I guess most paintings were back then, his style is quite unique and radical and could even have been painted in our own time. “Sheeny”, distorted and shadowy: Is it not the echo of El Greco? I like the simple title, too. The image is simple but potent. In this tiny drop of formula there is river, desert, mountains, sky, clouds and eternal silence. I’ll bet most of us would have just walked past this if we were zooming and browsing around in there. I wouldn’t have called this “UFO” although that’s not a bad title as it accentuates the mysteriousness of the image; I would have done something daring and called it “Jet Trail of the Ascension”. Yes, El Greco would have liked that, I think. 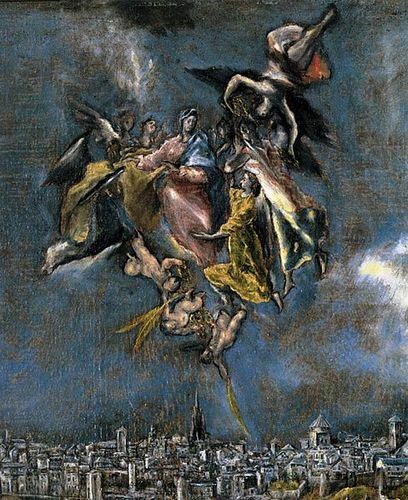 El Greco had a talent for combining religious themes with far-out, far-outed-ness. What exactly is going on there? The top right figure in the “sacred cluster” looks like a ballerina spinning on her head. 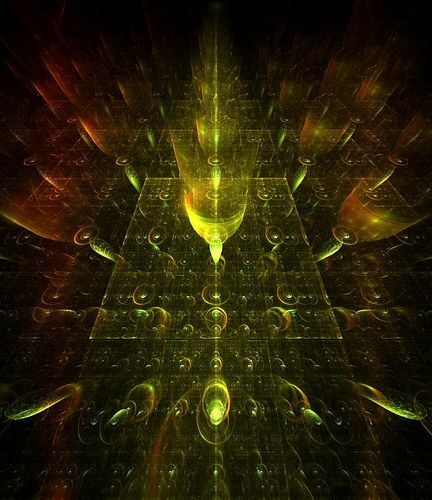 Like Eva’s fractal, this image is only partially understood like something half hidden in a shadow. And yet there is nothing disappointing about that. The Tornadoes from Toledos; Hologram isn’t bad either. There’s a glowing, fiery, aurora borealis look to this. Hey. 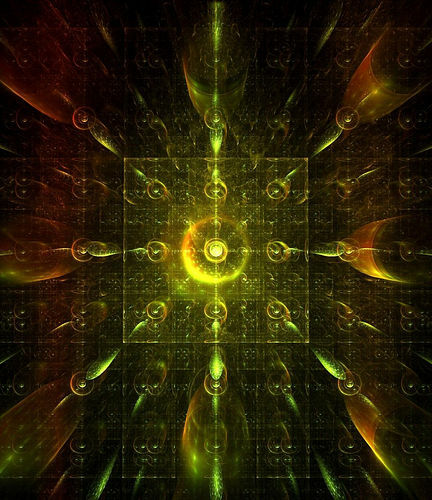 You don’t suppose this is a flame fractal, do you? Oh man. I gotta check the gallery page to see if it says anything. It’s a flame. I bookmarked this one before I wrote my recent posting suggesting that almost all flame fractals be extinguished. I must not have realized it was one of “those things”. This is like the apotheosis of apophysis. Good art speaks for itself and is more than the sum of it’s genes –or in this case, parameters. At least he didn’t make it with Chaotica. Then I’d really look foolish. Well this ain’t no flame fractal, for sure. But, look at the ghostly luminescence and the spirally tentacles and the way the animal’s body just slips away into the dark nothingness around it. Isn’t this the sort of creation we could expect if the flame fractal genre develops some more graphical options and parameter choices? I’m not a programmer or even a math person but I think the flame genre has some potential just based on what I see. At the moment it takes some real experimentation to come up with something that hasn’t been done before. ← Flame Fractals: Get the Fire Extinguisher! With a typical black background and increasingly translucent plane-filling patterns, It looked pretty much obvious at first sight that “Evolving Hologram” was a flame. A quite nice one. i agree w/ jeremie brunet that “evolving hologram” was obvious as a flame on sight. you must be joking when you say you didn’t realize it was a flame. please tell me you were joking. how can you pretend to be knowledgeable about fractals if it surprised you that that was a flame. it has all the apophysis hallmarks. sorry if i’m seeming hostile here but i’m honestly baffled and half beleiving that sentences like “Hey. 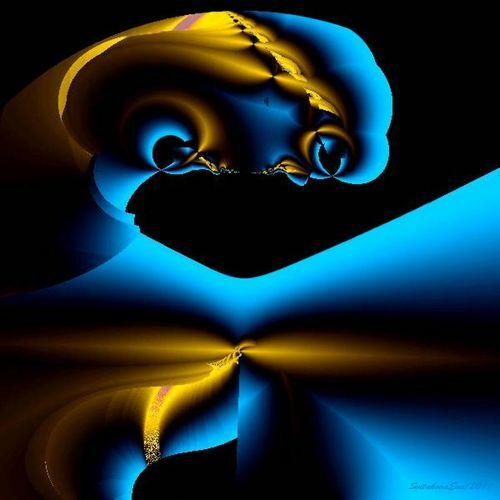 You don’t suppose this is a flame fractal, do you?” MUST be sarcasm. Very nice article. DorianoArt is certainly one to watch. His manipulations are developing considerable character too. 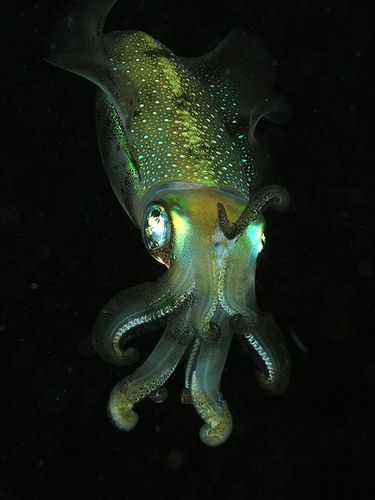 Images very like the cuttlefish are made in Apophysis. Last week one of my watches posted an image that shouted Vermeer loud and clear. The subject matter was different, of course, but the the penetrating darkness, even the palette, of that period were perfectly conveyed. your scuttlebutt still appears on OT and can be found published in the previous post as well. I do find it ironic, though, that you have seen fit to ban me from being able to comment on your DA page that’s linked above. Unlike you, I don’t believe “100% censorship” is possible on the Internet. I, like you, have hundreds of other virtual venues in which to easily post my thoughts and opinions should I wish to do so. So, I’m neither crying foul nor upset you’ve taken pre-emptive measures to blackball me. You have every right to decide what you choose to publish on your site. However, it’s unfortunate that you can’t seem to comprehend that OT can also exercise the same prerogative. Banning others while complaining about being banned makes you — and forgive me for being forthright — a hypocrite. I’m sure anyone visiting the link above will immediately deduce that you could never be capable of intentionally harassing a blog in what could sensibly be considered a trollish fashion. is in any moral position to be openly sermonizing on the subject of maturity. Please, if you can, try not to think of anything I’ve said here as criticism. Instead, try to visualize my remarks as helpful albeit unwanted good advice from a friend. Lyc has never had any problems attaching his name to a post. Perhaps you think it was him, because of slamming a renderer you have never used, simply because it has it’s name attached to it. Tim trolled for that response on FF. Lyc provided his opinion when asked. When you didn’t like it, you attack his software. Like you attack everyone else. I am not sure who your biggest fan is, but they certainly hit the nail on the head. 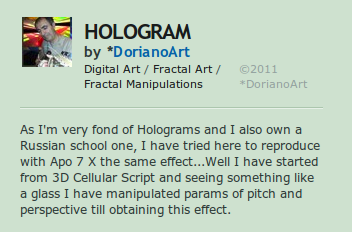 If you can’t take the heat, get out of the kitchen; Orbit Trolling is all about trolling the fractal scene, writing articles about how programmers make poor artists, and calling an entire genre of fractal art a waste of time. I’ll stop trolling you on my turf, where I can block your comments, once you have stopped doing the same. I can continue to troll you, just as you have trolled me and my preferred fractal artform over the last 5 years, up to last week. You don’t like it? Somebody call the waaambulance! PS. Congratulations on working out I was “your biggest fan!” It was a reference to recent post on this blog: http://orbittrap.ca/?p=2903 I’m glad that you guys have decided to display my posts now. In the interest of accuracy, I’d like to point out that it was actually Tim who made remarks about Lyc’s software. This error, coupled with you being monumentally incorrect about the identity of OT’s “biggest fan,” pretty much means that everything you wrote in your last comment is dead wrong. You are right about one thing, though. Something hit somebody on the head somewhere.